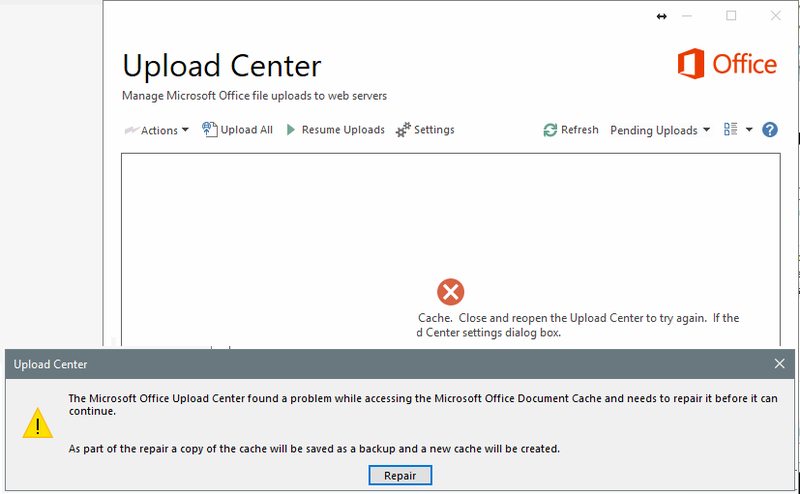 "The Microsoft Office Upload Center found a problem while accessing the Microsoft Office Document cache and needs to repair it before it can continue. As part of the repair a copy of the cache will be saved as backup and a new cache will be created." You can click Repair to solve the problem. If it can solve the problem, then great! Sometimes, clicking Repair cannot solve the problem. This is a known Microsoft bug caused by data corruption in the Office Document Cache. Microsoft has provided a manual fix as documented at this link "Delete your Office Document Cache"
As documented, when you save a file to a cloud drive, Office will save some files in the Office Document Cache Folder to ensure all changes are saved to the cloud. Sometimes when you use Office with other apps in the cloud, the apps fail to sync properly before you close Office and this can damage, or corrupt, your Office Document Cache. Usually, Office can repair damaged cache files. However, when a cloud app hasn't synced correctly, it can prevent Office from making the repairs. You can follow the Microsoft instructions to delete the Office Document Cache files. The problem is the files (or folder) could be locked by MS Office (or Upload Center). So you need to close all MS programs first; also, you might need to manually end Upload Center using Windows Task Manager.